The London streetscape has long been characterized by the the ubiquitous bollard, usually a metal, stone (or more recently) concrete post intended to discourage vehicular traffic from trespassing into pedestrian areas and vulnerable buildings or street features. 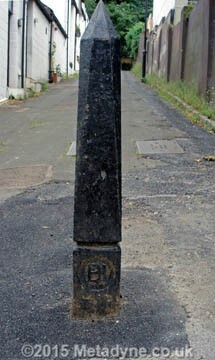 The humble bollard was provided in large numbers and was a visible manifestation of activity by the local highway authority, often the local parish or vestry and later the district or borough council. Perhaps for this reason the highway authorities usually marked bollards with evidence of their ownership: often initials were used but sometimes coats of arms were displayed. Perhaps, also, fear of theft of the metal marks featured in the thinking of marking bollards. In the days when many parishes were very small, the chosen design of bollard would appear in compact areas and become a local feature of that area, contributing to the sense of place. Bollards, by their nature, were very hard wearing and the rust-free cast iron types could easily be recovered when no longer required and stored for reuse elsewhere, a practice that continues to this day, though perhaps less assiduously in a world where so many activities are contracted out. 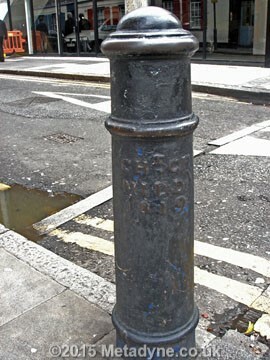 When local authorities were amalgamated into much larger areas (as nearly all have been) then it became entirely likely that a proportion of recovered bollards would be reused outside their original areas and there are lots of examples where this has happened (for example Marylebone bollards being reused in the savoy area). One should be aware of this as some strange theories have emerged about the positioning of some bollards. 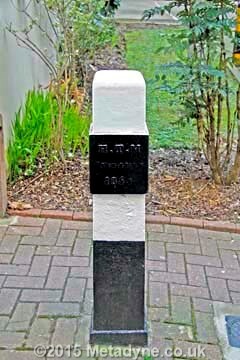 On the subject of strange theories, many bollards that bear parish marks have been accused of being parish boundary marks. By their nature, parish boundary marks occur only at parish boundaries and are generally positioned somewhere unlikely to be struck by vehicles, typically on or against boundary walls. Bollards, except by accident, will not be at a parish boundary and are nearly always alongside the carriageway (where they are very vulnerable) or somewhere else where they are clearly supposed to deter vehicles. With an exceedingly small number of exceptions, their differing purpose is usually fairly clear and the designs are generally different. Bollards come in a wide range of different stylies. Most are metal, and cast iron was the favoured material as it was very strong, easy and cheap to cast and did not rust. A cast iron bollard would resist all but the most violent collision, perhaps sufficient to displace it (after which it could be put back) and in the worst cases it would break or shatter, but this would be unusual. Early bollards were sometimes adaptations of old cannons, predominantly British and sold for scrap by the Board of Ordnance, but very few of these survive; some may have been captured French pieces (though not from Trafalgar). A very interesting dissertation about these may be found HERE. 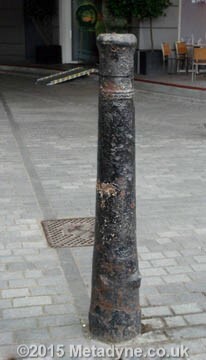 There are many bollards that appear cannon-like (typically with a round ball-like protrusion in the muzzle, but the vast majority are standard pieces of street furnture always intended for use as a bollard; it is possible these were first made by founders reusing old moulds and looking for new opportunities when cannon manufacturing ceased, but the point is that very few real cannons, buried breech down, survive. Another common type of bollard was the square-section post, a plain but functional design that used a minimum of metal and was probably quite cheap to make and could carry the authority's initials in an approved position. Large authorities, such as Westminster and St Pancras, could afford their own designs and surviving marks exist in very large numbers. St Pancras used a rectangular section tapered column with ribbing around the periphery. These were marked SPPM (St Pancras Parish Middlesex) until 1889 and SPPL afterwards (the County of London having been created). A few parishes seem to have succombed to the need to display civic pride by having very ornate bollards that must have been quite expensive. 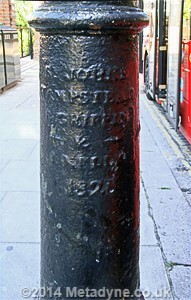 A typical cast iron traffic bollard bearing the marks CH-CH Middx 1819 upon it (Christchurch Middlesex). Perfectly ordinary bollards such as these are often mistaken for some kind of boundary mark, but they are not. Nor are they suitable as boundary markers (which almost never create an obstruction in pavement and would normally be designed to operate as one of a pair), and are rarely if ever on boundaries. This one just like at the one on left has even been given listed status as a parish boundary marker. 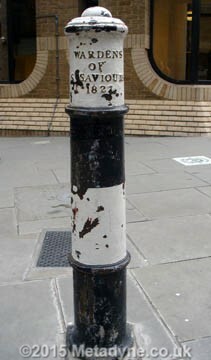 This excellent example of a cannon-type traffic bollard is marked St James Clerkenwell. This splendid 1833 example might well be confused with a boundary mark, but it actually appears to be a very unusual stone traffic bollard. It is not located on or near any boundary, it is not located in a suitable position for a boundary marker (which would be against the wall). It is situated in the parish of Hampstead, but Hampstead boundary markers all appear to use the initials St J H (or, much later, H.V.) rather than HP. Stone bollards are very unusual and metal is the norm given the likelihood that stone would break or shatter if hit by mechanically propelled vehicles. 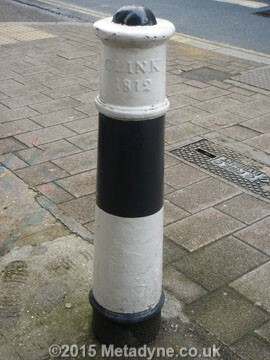 The right hand image is one of the bollards common within the 'Clink' precinct in Southwark. This was not a separate parish, or even extra-parochial, but did have a certain autonomy and from 1786 had its own paving commission. It is not a boundary marker, nor on a boundary, and the Clink bollards are freely mixed with others that have presumably been relocated. This traffic bollard is marked H.T.M. Commission 1861, and is one of three surviving marks acknowledging the existence of the tiny parish of Holy Trinity Minories, absorbed into Whitechapel (St Mary) in 1895. One hope these rarities are subject to some kind of preservation policy. A pleasing traffic bollard near Highgate. This bears a monogram near the base involving the letters B H and L which must mean Hornsey Local Board, a former local authority for this area. 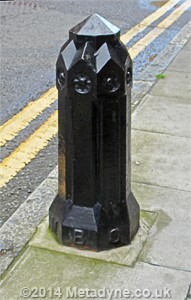 This is one of a group of bollards, all dated 1883. 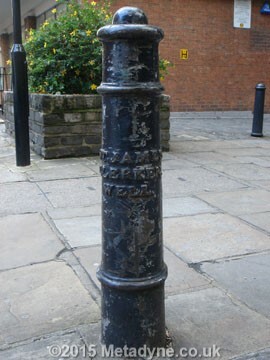 A bollard from the parish of St Saviour's Southwark dated 1821. This ancient-looking bollard in Southwark has an open muzzle, perhaps suggestive it really was a recovered cannon. 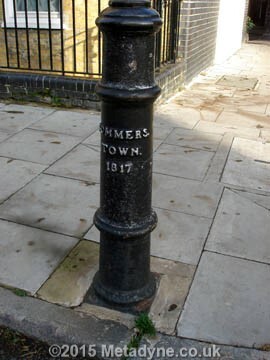 This 1817 survival of a Sommers Town bollard adds interest to the locality near Euston. This area was not a separate parish, but did have its own paving commissioners, who presumably arranged for bollards to be placed where required. It is more usually spelt Somers Town today, though the name is scarcely used. This is not located on a parish boundary and its position is consistent with an ordinary traffic bollard. 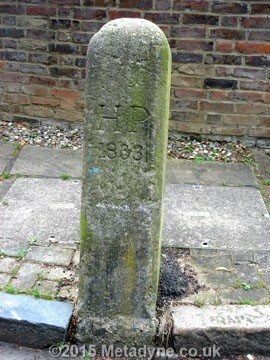 However, the design appears similar to a particular style of metal Hampstead boundary pillar (though not very common). It has probably been recovered from an unneeded boundary position and reassigned for use as a bollard. It is marked H.P. 1824; a pillar of this description had once been used as a boundary mark in nearrby Southampton Road. A cannon-type bollard in Hampstead, marked St John's Hampstead, B. Grriffin & J. Kelly 1828. Listed. 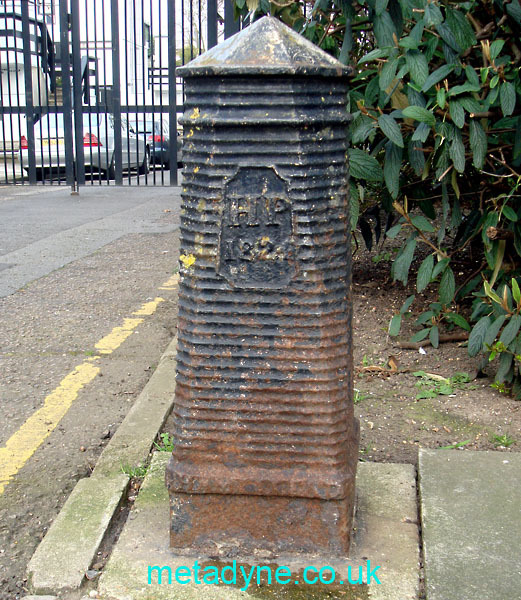 An ornate bollard produced by Metropolitan Borough of Camberwell.